POETS IN MILWAUKEE UNITE! HAPPY POETRY MONTH! MAKE SURE YOU CHECK OUT THIS AMAZING FILM AND STAY FOR THE TALKBACK OPPORTUNITY! This screening will showcase all six micro documentaries, each running 6-10 minutes in length. Each doc combines a filmed interview and poetry reading. Join us for a brief talk back after the screening to further explore poetry in Milwaukee. Ars Poetica was created by Sam Pekarske, Kristin Peterson Kaszubowski,Sam Kirchoff, Ceci Elsbernd, and Serbata Tarrer and filmed at Woodland Pattern Book Center. Destinny “Deolinda Abstrac” Fletcher will be performing alongside 2 other amazing local artists to share the love of the environment and cultural appreciation. Register to attend as the event will be free beyond that! Who should attend: High school and college age youth, educators, community members and environmental and youth serving organization representatives. This will be a night where artists are invited to share films, music, visual art, spoken word and storytelling in Milwaukee. BE THERE TO SHARE WITH US FOR THE HOLIDAYS! Public parking is available at the Brewery Parking Garage at 1213 N 9th Street. These writers include Susan Firer, Destinny “Deolinda Abstrac” Fletcher, Siwar Masannat, Denise Sweet, and Lucy Tan. The Power of Storytelling by House of the Tomato presents the amazing Destinny “Deolinda Abstrac” Fletcher and Sue Blaustein for a night of poetry, humor, and charismatic stories! All in GREEN BAY, WISCONSIN! Come support your local Milwaukee Natives as we travel to bless the mic with our words of wisdom, ownership, and womanhood. This event will be jammed pack with so many talented and powerful female artists from Milwaukee, Chicago, Waukegan, and of course Kenosha! Come through to support the world of women through poetry, visual art, music, fashion, and much more! Destinny “Deolinda Abstrac” Fletcher will be there to rock the stage with these amazing women! You don’t want to miss all this feminine/femme energy! ALL FREE! Destinny "Deolinda Abstrac" Fletcher will be rocking the stage at this year's Black Arts Fest MKE! Show up and Show out for all this amazing art! From visual arts to dance and performance art, YOU GOTTA BE THERE FOR THE CULTURE! A celebration of African and African American traditional and contemporary culture through artistic expression - dance, music, cultural activities for children, a marketplace, food and so much more. Performances from the amazing Naima Adedapo, Tony! Toni! Tone, MC Lyte, Bobby Rush, and Gabriel Sanchez presents The Prince Experience! Destinny "Deolinda Abstrac" Fletcher has been invited to rock the stage IN BROOKLYN, NEW YORK! Check us out in a city near you! "Black Girl Be Storm" copies will be there along with your favorite poems and new art coming your way! Alongside, there will be crazy-dope musicians, artists, photographers, and models! YOU CAN'T MISS THIS ASTONIDHING EVENT! Destinny "Deolinda Abstrac" Fletcher is back at the Wom!nz Spot, PRIDEFEST! Coming to rock out the stage with a gang of amazing poets!! DON'T MISS THIS PHENOMENON THAT EXCEEDS ALL EXPECTATIONS! Some old poems. Some new! Check out the projects we've been working on! WORDS FROM PRIDEFEST ON PREVIOUS YEARS: Whether she’s on the stage or on the page, Ms. Deolinda Abstrac creates such an intimate atmosphere with her poetry and her pieces that it feels like she’s speaking directly to you. Her poetry performance represents womanhood, body positivity, and self-awareness. Destiny “DeolindaAbstrac” Fletcher has developed a continuous relationship with Pridefest’s Wom!nz Spot Lounge as this will be her 3rd performance prior to previous showcases. One year following the release of Return to the Gathering Place of the Waters, Milwaukee's poetry community remains vibrant and strong. Join us for an evening of celebrating the broad variety of excellent verse our city contains. We'll feature local presses and readings by over 30 Milwaukee scriveners. We'll gush, we'll listen, we'll party. Destinny "Deolinda Abstrac" Fletcher was invited to share some poetry on this night with many amazing local artist of the craft! YOU DON'T WANT TO MISS THIS! Back to Toronto we go! Destinny "Deolinda Abstrac" Fletcher will be performing in Toronto, Ontario once again with RAW ARTISTS! CHECK IT OUT! TICKETS ARE ON SALE NOW! CAN'T MAKE IT TO THE SHOWCASE? DONATE A TICKET FOR A GREAT CAUSE! MOVEMENTS! A night of moving art! Come out for an exhibition of film, performance, and music above Company Brewing on April 28th! Enter through the bar and go up the stairs in the back. Featuring work from; Destinny Fletcher, MPower Theater, Austin Rogers, M.O. Guzman, Nia Rutledge, Vinny Tunzi, Teena Wilder, Kylie Leverette, and musical performances by LOOPLESS and Fuzzyhead! Destinny "Deolinda Abstrac" Fletcher and many other amazing artists will rock the house Saturday night for a grand time! Along with so many dope performers, there will be artwork from your local artists as well to celebrate! Copies of "Black Girl Be Storm" will also be available for $15, but we only have a limited supplies, so make sure to get a copy before they're all gone! The Live and Online: Expression Session is a writing workshop, a community, and culminates with a featured performance by Destinny Fletcher. Attend from anywhere in the world by phone or video. Destinny "Deolinda Abstrac" Fletcher will be performing along with many amazing women in Milwaukee! 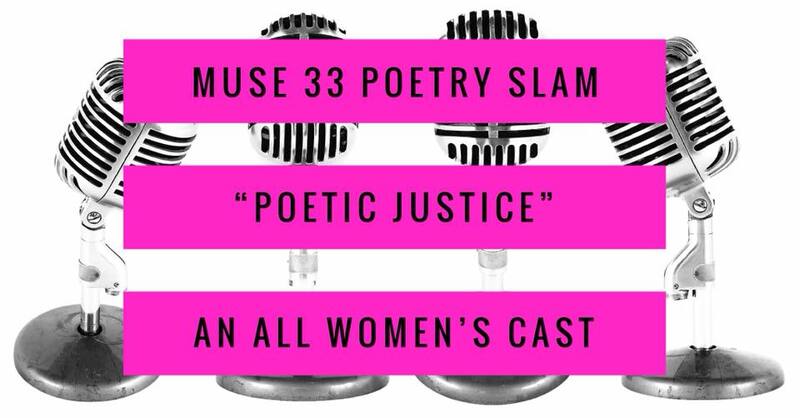 Join us at Muse 33 for “Poetic Justice,” an all Women’s cast Poetry Slam. Mix and mingle at 6:00pm. Show at 7:00pm. Thank you to all of our friends, families, and readers for all of your hard work and motivation. RAW Artists invited us to perform at The Rave/Eagles Ballroom back in October 2017 and with such dedication and amazing ticket sales, we were invited to showcase out of state for our next show. Well, we've got our answer! Because of you all, we have been invited to showcase in TORONTO, ONTARIO IN CANADA!! The excitement is real as we represent Milwaukee, WI all over the globe! Teatro di Affetto in conjunction with Vegetarian Alcoholic Press is hosting a funeral for the internet! Close 2017 by celebrating the release of a special post-internet dystopia-themed chapbook while raising funds for the ongoing fight for Net Neutrality. EULOGY CONTEST: Write your own absurd and over-the-top eulogy for Net Neutrality. You may perform it yourself, or have it performed. Winner will receive an exciting gift from VA Press. SHOWCASE: Multiple Milwaukee presses and independently published writers all under one roof. We're in an Art Exhibit!! Please join us on Friday, December 1st at 7:00pm for an evening of poetry with spoken word artist Destinny "Deolinda Abstrac" Fletcher who provided the narrative for "the Beautiful": The Stories She Tell". FIGHT FOR A FUNKY CURE! A collection of MIlwaukee's best poets, MCs, artists and performers come together for this special one-of-a-kind event to celebrate the ones we love through music and art, with 100% of the proceeds going to Cynthia's Breast Cancer Giving Circle. Performers include Brit Nicole, Mikey Cody Apollo,Bobby Drake, Destinny Fletcher, Elle Renee, AUTOMatic and more! And there will be live art by Jazz West! All of our sponsors have generously donated raffle prizes that will be given away throughout the evening and our gracious venue Company Brewing is donating a portion of their dinner sales to the cause. Visit http://reservations.companybrewing.com/ for dinner reservations. Don't miss this fun event for a cause! Come check us out for a night of poetry, music, and the dopest emcees of Milwaukee. Destinny "Deolinda Abstrac" Fletcher will be performing at THE RAVE as a contribute and collaboration of Milwaukee Artist and many artist all over the country! There will also be a fashion show for your enjoyment! CHECK OUT OUR PROFILE ON RAW ARTISTS! Join us at the screening of my short film "‘THE BEAUTIFUL': THE STORIES SHE TELL" at the Milwaukee Film Festival. By unraveling the scarf, the woman reveals her hair as the internal thoughts about black self-image are projected through spoken word. Arrive early to get a ticket and a seat!!! Because we live in an era where the arts are being slashed, we have decided to bring all sorts of arts together. To smash for a flash: to create community through words, through dance, through song, through brief flashes of something else. Come party with us! We'll have food, kid friendly games, and local entertainment. The only thing we're missing is you! Hope you'll join us there. -- Poets...more info to come! -- Music...more info to come! -- and perhaps, even more things to be listed soon! !!!! !BEST OF ALL.... It's all FREE!!!!! Barricades will be blocking E Clarke St from just east of Holton St to Pierce St. Please be conscious of animal and child safety when considering to bring a pet! This is a safe-space - please be considerate of others and check any hate-speech outside the barricades. Are you interested in contributing food/games to the block party???? Please join us for our third event of the 2017 season! Poetry in the Park is a free and open to the public event that aims to build community and promote a wider appreciation for the written and spoken word. This outdoor reading series is one of a kind in the Milwaukee area, so don't miss out! The park continues to be a public space during this event, so feel free to take advantage by bringing blankets and chairs, beverages and snacks, pets and pals. August’s Poetry in the Park lineup features four poets that will tickle your senses and rattle your brain! DESTINNY FLETCHER (Black Girl Be Storm) is a force to be reckoned with in Milwaukee’s poetry scene. RICHARD MEIER (Shelly Gave Jane a Guitar; the Pure Block of the Whole Imaginary) wraps his observations in rhythmic funky surprise. UWM Professor MAURICIO KILWEIN-GUEVARA (Poema; Autobiography of So-and-So) brings a sharp and beautiful clarity to the chaotic world. And LISA FISHMAN (24 Pages and Other Poems; F L O W E R C A R T) tugs at the corners of language, expression, and image in poems that will quench your mind’s thirst. Destinny "Deolinda Abstrac" Fletcher is in Butterfly Confessions once again with a powerful message and monologue! You don't want to miss this!! BUTTERFLY CONFESSIONS, a stage-play, is a love letter to women of color that reveals heartfelt emotions about intimacy, sexual responsibility and overcoming adversity. The play blends humor and heartbreak with education, empowerment and inspiration while bringing awareness to domestic violence and HIV/AIDS. Butterfly Confessions was created and conceived by Yetta Young but was a collective effort. MPOWER THEATER is a non-profit acting troupe dedicated to empowering survivors and offering opportunities for underrepresented artists, while creating and reenacting theater with a social justice focus on activism, advocacy, and awareness. UWM students may qualify for a discount if the contact MPowerTheater@gmail.com from their UWM email address. Ebony J. Murphy Jay Winters, Jocelynn Hosea-Davis, Marisa Hernandez-De Windt, Nikita Michelle, Tiffany Miller, Maya O'Day-Biddle, Stephanie Kimble, Star D Burks, Pansy Williams, La Soule, Regina Boston-Dixon, Danita Graham, Selena Abyss Mcknight, Jendora Kelley, Kita Mone't Edwards, Marlo Shaw, Tricia C Vasquez-Young, Shaquita Marie, LaKysha Burns, and Destinny Fletcher. Did you know we host a fabulous Spoken Word Showcase on Sunday June 11th? Yes! It's 5:15-6:45! See artists like Destinny "Deolinda Abstrac" Fletcher! A woman with the power to create peace within her community and culture through the phenomenon in her voice. With Milwaukee, WI as her hometown, art becomes her sound and her greatest enigma. Working with the youth, Destinny experiences cultural differences and graphic stories. She relates to them heavily and even writes stories, inspired by her students. She was a 2012 State Poetry Slam Finalist, performed in “Yetta Young's Butterfly Confessions” stage play and published her first chapbook: "Fireflies & Peroxide" in March of 2014 and her new release "Black Girl Be Storm" in May 2016 among many other appearances! Come check her out! Destinny "Deolinda Abstrac" Fletcher will be in WAUKEGAN, IL!! Here On Earth is Public Garden First Fest. We are celebrating our year run and the beauty of mother earth the weekend of the 21st. we are excited to have some returning artist and of course new faces as well. Lets all make this one of the biggest yet!!! TICKETS: $7 ONLINE! $10 AT DOOR! After & GREAT Presents: RESISTANCE! Destinny "Deolinda Abstrac" Fletcher will be performing at this event with new projects! Stay Tune! After will release a special resistance-themed issue for purchase alongside GREAT. All royalties will benefit the Standing Rock water protectors and the Milwaukee, WI chapter of SURJ through December 31st, 2017. Issues of GREAT and After will be be available as a pair for $20, or $12 apiece. Even if you already have a copy of GREAT, you won’t want to miss this issue of After. After magazine is a submission-based arts magazine focused on social justice, community outreach, and artist collaboration.